An article called "Hiroshima" written by John Hersey was published in The New Yorker magazine in August 1946, a year after World War II ended. The article was based on interviews with atomic bomb survivors and tells their experiences the morning of the blast and for the next few days and weeks. It was a calm and accurate account of survival in the first city to be destroyed by a single weapon. 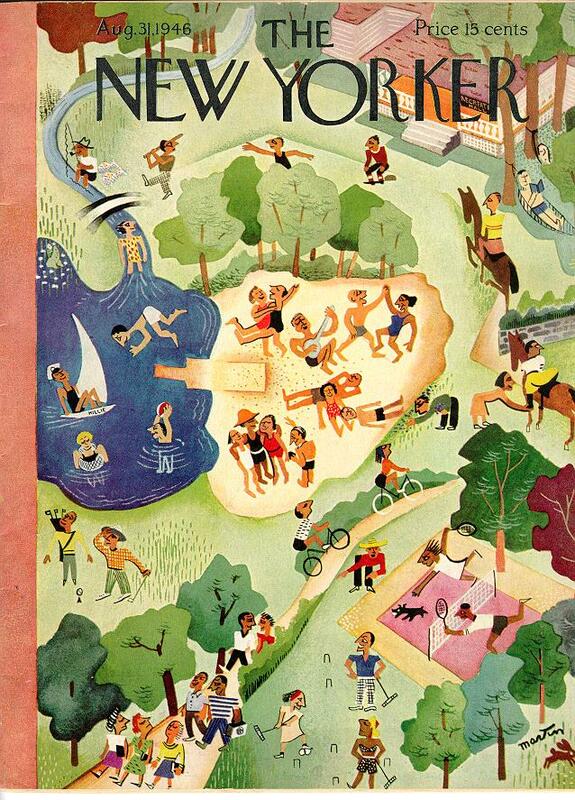 "Hiroshima" took over the entire issue of the The New Yorker, there were no articles or cartoons. The issue caused a tremendous effect, and sold out within hours. Many magazines and newspapers commented on the article. The full text was read on the radio in the U.S. and other countries. The Book-of-the-Month club sent a free copy in book form to all its members. "Hiroshima" was quickly published as a book, and remains in print today. I spent a few weeks working on a term paper about the publication of "Hiroshima" for my one-and-only graduate level liberal arts course (in 1997) and wanted to make my research available to all who are interested (all 53 of you, that is). My paper discusses the events leading up to the publication of the article, what happened afterwards, and the effects of the article. Read the original article, published online by The New Yorker: Hiroshima. 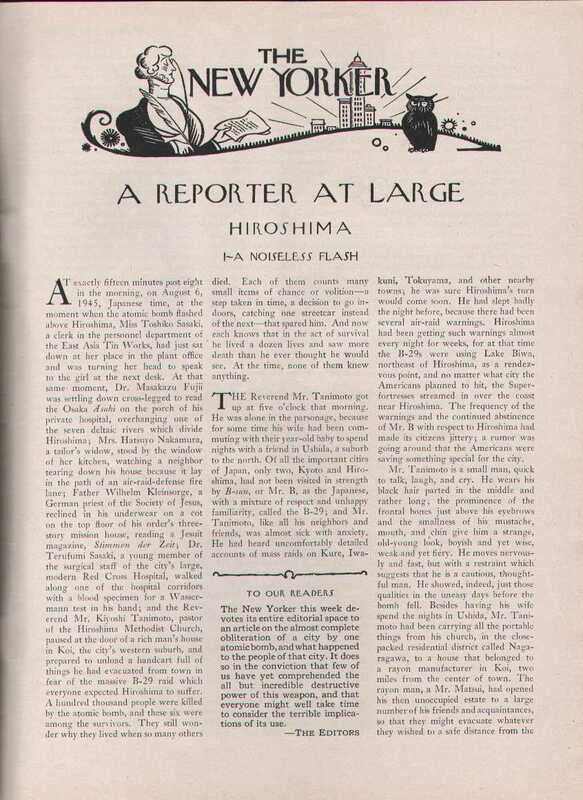 Read my paper, The Publication of Hersey's "Hiroshima" in The New Yorker. Read about John Hersey online. If you have found my paper useful (as a student or teacher) please let me know. Also many kind notes from people who haven't mentioned any academic affiliation - thanks everyone. Comprehensive Hersey obituary in Yale Alumni magazine. Some teaching resources for secondary school teachers. Carol Meyerson is a John Hersey book collector. In February 1999, NYU's journalism department published a list of the "Top 100 Works of Journalism in the United States in the 20th Century." 'Hiroshima' places first. Another American journalist, George Weller, visited Nagasaki in September 1945, just a few weeks after the second atomic bomb had been dropped there. He filed detailed stories about what he saw there, but the articles were censored by the American military. More info at the Wikipedia entry First Into Nagasaki. In 2012 (15 years after doing my paper) I learned from a scholar in Spain that a remarkably similar paper had been published in 1974 by a historian named Michael J. Yavenditti in The Pacific Historical Review. The article is available via jstor.org at http://www.jstor.org/stable/3637589?origin=JSTOR-pdf&. If you are doing serious research on this topic you probably need to get this paper. I didn't have access to this article when I was putting together my stuff but it's clear from a quick review that we used a lot of the same sources. The Decision to Use the Atomic Bomb by Gar Alperovitz, et al. City of Seven Rivers a historical novel by William P. Bekkala (partly based on research from this site). A collection of research papers written by Fellows and Faculty of the Joan Shorenstein Center on the Press, Politics, and Public Policy (John F. Kennedy School of Government, Harvard University). Contributors include: Tim Cooke, Andrew Glass, Nik Gowing, Jack Nelson, Frederick Schauer, Nachman Shai, Ramindar Singh, Matthew Storin, and Gadi Wolfsfeld. Edited by my beloved wife, Nancy Palmer!